Grupo de lectura y discusión del texto de Angrist and Pischke (Mostly Harmless Econometrics). Coordinador: Walter Sosa Escudero. Universidad de San Andrés. 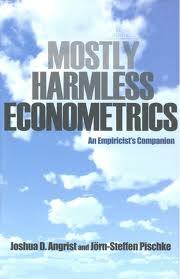 A statisticians perspective on Mostly Harmless Econometrics: An Empiricists Companion. Luquitas Figal Garone Agradecemos a Marcelo Leiras que nos envío esta reseña. Despite its broad title, the book’s coverage is limited to one corner of econometrics. methods, Bayesian inference, or models other than linear regression. with in their applied work. theorems; more on that below) and is informative and pleasant to read. between statisticians’ and econometricians’ attitudes. of regression analyses I have seen, there can be a lot of transformation and combination of variables. of their use to create a saturated model with discrete predictors), a point to which I shall return below. From my perspective, these omissions are not a problem, because model building and interactions are standard material in any statistical textbook on regression methods. But I am a little worried that students and researchers in economics might be misled by Angrist and Pischke’s conversational yet authoritative tone into thinking that the model and predictors come to the researchers fully formed. a better sense of what else is out there. focused on model building) as a supplement. the treatment eﬀect applies only to the people who could have had the treatment or the control done to them, with various designs and estimation strategies corresponding to diﬀerent estimands (the eﬀect of the treatment on the treated, and so forth). cases we are averaging over. Any discussion of particular average treatment eﬀects is rel-evant because treatment eﬀects vary; that is, the treatment interacts with pretreatment variables. advantage over econometricians’ often laser-like focus on average treatment eﬀects. 4. Which comes ﬁrst, the causal question or the natural experiment? do is to ﬁnd the instrument ﬁrst, and then they go from there. They might see something in the newspaper or hear something on the radio and think, Hey—there is a natural experiment—it could make a good instrument! And then they go from there. make more sense to consider the natural experiment as coming ﬁrst. that the rest of us analyze. a tool for making regression more eﬀective. instead of presenting it more as a matter of taste as they do here. suppose it is how econometricians communicate. Presentation of results: I like their use of graphs. I would have liked some scatterplots of raw data, but I know that is not economists’ style. Overall, I feel the presentation is excellent. hapless instructors to explain the diﬀerences. Hill and several others for helpful suggestions. level/Hierarchical Models. New York: Cambridge University Press. books include Bayesian Data Analysis (with John B. Carlin, Hal S. Stern, and Donald B. Park, Boris Shor, Joseph Bafumi, and Jeronimo Cortina). Les dejo un link con Holland + Comments + Rejoinder - JASA 1986. Luquitas Figal Garone: Recordamos que este miércoles NO tenemos reunión. Finalmente, este es un link a la reunion de la Impact Evaluation Network, que tendra lugar el sabado que viene en Miami. Guido Imbens dara un mini-curso sobre impact evaluation. Un servidor, estara haciendo como que sabe del tema. Walter Sosa: Resumen resumido de hoy. Le pegamos un pantallazo a la cuestion comparativa entre regression, matching y p. score, con una fuerte dosis de pragmatismo, la cual está implicita en todo el capitulo (la preferencia por regression). Despues la discusion giro a la cuestion de los weights implicitos en regression y matching. Quedamos en que nuestra proxima reunion sera el 13 de octubre. Cubriremos hasta la parte de asymptotics de IV (sin incluir esto ultimo). Gracias por la energia positiva en esta actividad, se nota que leen con detalle y creatividad. Mostly Harmful Group: Te invitamos a participar de la 3ra reunión de nuestro reading group. En esta ocasión vamos a estar discutiendo sobre el punto 3.3 del libro ("Mostly Harmful Econometrics"). Ya sea en forma presencial o virtual esperamos contar con tu participación. Reunión: Miércoles 29 de Septiembre, 12.30 a 13.30 hs, Universidad de San Andrés. El grupo se reúne los miércoles de 12:30 a 13.30 en el campus de UdeSA. Tambien es posible participar virtualmente, es decir, leer en paralelo y hacer comentarios, sugerencias, etc., utilizando este medio, nuestro facebook, o simplemente el email. Los esperamos a todos. Reading group on Angrist and Pischke's Mostly Harmless Econometrics, at Universidad de San Andres, Argentina.